A Pirate's Life for Me!! Ahoy, me hearties! Have ye been working on yer pirate speak? If not, ye may want to catch up for this month’s Free Realms game update included a brand new minigame, Pirate's Plunder! Long ago, the humans and a few pixies banded together and fled across the seas to escape the cataclysm. With all the ninjas roaming Sacred Grove, it was only a matter of time before pirates anchored their ships in Seaside. Now, the Crusty Crab Fleet has returned to their home land with plenty of loot and a competitive game. If you happen to cross one of these pirate-like characters, be sure to pay close attention to what they have to say. If you're up for a challenge, make your way to down to the water’s edge. Off the pier, Jolly Roger is awaiting your ship's registration. Any of the podiums on the pier will start you in the new Pirate's Plunder minigame. The primary concept of Pirate's Plunder is to collect the most treasure. You can collect treasure where any "X" marks the spot or by defeating other ships and knocking out the treasure they have collected. Your objective is to pick up as much cargo as you can and make your way back to your home base while avoiding attacks from other captains. With a variety of maps, you're sure to plunder a ton of treasure! There are plenty of power-ups to help you along your voyage. Some power-ups will make your cannons more powerful, and others will help you navigate the map at a quicker pace. If you ever find yourself in a rut, have no fear! You can stop as a repair power-up or make your way back to your base to fix your armor. Power-ups aren't the only way to traverse with ease. There are also whirlwinds that will teleport you from one whirlpool to the next across the sea. Try to use these whenever you can. They'll make travel time hasty and are a great way to escape from other player's attacks as well. Another tip that isn't as obvious is the use of the water trails behind other players as they zoom around.  If you're chasing another player, you can follow their wake. This will make catching them much easier by boosting your speed a little! Starting out, you can choose between three ships in the cave at your home base- the Eel, Juggernaut, and Cutlass-, but you can buy more! The Eel is the smallest ship. It's speedy and easy to maneuver, but it lacks powerful cannons and armor. The Juggernaut, on the other hand, is a sturdy and well-armed ship which can carry a large load of treasure, but it's hard to steer. In-between both of these ships is the Cutlass, a medium ship. It carries a decent amount of cargo, shoot cannons sufficiently, and can turn adequately. Don't forget about your flag decal while you're in the cave! There's a variety of choices. Choose one that will express your inner pirate. If you complete the game, you can receive a variety of rewards, including treasure map paintings and rugs for your houses. You can even put a flag on your wall! There are also several wearables, not only for your avatar, but for your furry friends as well. If you're not really into shooting cannons or stealing booty, you can always celebrate the pirate affair by buying items from the Marketplace. So far, my favorites have been the oasis and giant pirate ship. The bed is pretty rad too. It works similar to the bounce pads. My character is all decked out in pirate garb. I even got myself a new tiger pet. Now, I just need to win that hook and my outfit will be complete! So tell me, what's your favorite part of the Pirate's Plunder update? I can't wait to hear your answers! 2 people rated this. 0 bumps / 2 buries! 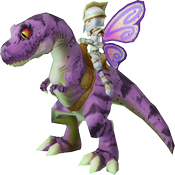 Free Realms is filled with all kinds of mystical creatures that players can befriend, train, dress up and even RIDE. 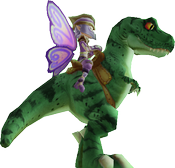 With the large variety of pets at launch (several varieties of dogs and cats) and the later addition of Ponies, Pegasus, Unicorns, Dragons and Dinosaurs, it was only a matter of time before players wanted to take these new friends for a ride! So how could we resist creating Rides! Rides in Free Realms allow players to move quickly through the over world with excitement. To be a bit more precise, players are granted a speed bonus of approximately a 150% of the normal player run speed. Our first Rides included striped T-Rex’s and a gold-tipped dragons. Each has its own texture and a variety of tints. Why these particular creatures first? Well, the team came up with a ton of ideas, but we wanted our first rides to not only be stylish, but give players something to brag about. I mean, who doesn’t want to saddle up on a dragon and float through the crowds in the Crossroads? Who wouldn’t want to romp through Briarwood on a fierce T-Rex? Well, if dinos and dragons aren’t your Ride of choice, we most recently introduced Horse and Pegasus Rides! 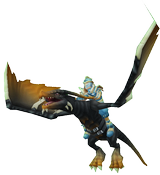 These new pets definitely give the Dragon and T-Rex some cool competition as they trot and gallop across Free Realms. The Pegasus is a mythical horse that unfurls its wings as it takes stride. If you prefer more modern horses, there is the Stallion or White-Nosed Mare, each available in six different colors. And they sure do love to jump! And, acquiring any of these Rides is a cinch! Players who don't have a ride can access the Rides category in the Marketplace by easily clicking the Ride icon on their game dock. What if you already have a ride and you want to buy a new one? Don't fret! Go to the Shops link on your game dock and choose Marketplace. Then, you can click the Rides category from there. You can switch between your rides by clicking the Ride icon on your game dock. Pick the one you want and you're set! For those who prefer to traverse the 3D world, stop by any of the stables to pick up a local breed. The stables are located in Seaside, Sanctuary, Merry Vale, Highroad Junction, and Lakeshore. Transportation in Free Realms doesn't end here! We hope to offer more types of exotic beasts, and possibly a few mechanical Rides to boot. I've already bought myself a few of the Rides...My current favorites are my red gold-tipped dragon and my purple Pegasus (Can you tell I like Rides with wings!?). What's your favorite Ride? Tell us what you would like to see! P.S. If you have some extra time, the idle animation for each of the rides is pretty sweet.